You've never heard complaints about paying child support until it's a woman who has to pay it. So called "Child Support" is nothing more than welfare for mothers. Look it up - TITLE IV—GRANTS TO STATES FOR AID AND SERVICES TO NEEDY FAMILIES WITH CHILDREN AND FOR CHILD-WELFARE SERVICES is what defines "child support" and that is a welfare law under Social Secuirty. It was originally passed to reimburse the government for welfare payments paid to mothers on welfare. However it has now evolved into a means of extorting payments from middle-class fathers whose children are not and never have been on welfare - extracting money from fathers with children actually on welfare is largely ignored as middle-class fathers are MUCH more profitable targets. take his property and sell it. 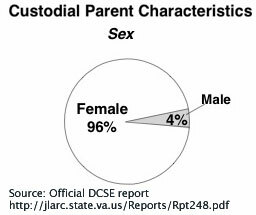 So as you see not only are custody awards gender biased (96% to 4%) but gender biased is also practiced by DCSE in that it will take quite unpleasant action against a father who pays all but $50/month of the ordered amount but will do nothing at all to a mother who spends $50/month of "Child Support" on things unrelated to the children. Another way to look at "Child Support" not being for supporting children is who gets to spend it. If the children are with the mother the mother can use "Child Support" money to buy food, clothes, entertainment for the children. However when the children are "visiting" the father can the father use the "Child Support" money to pay for food, clothes, entertainment for his children? No he must still pay the mother the FULL amount. Say the father sends his children money, clothes, etc while they are at the mothers, does that reduce the amount he must pay the mother? No. What if the children spend 100% of their time "visiting" the father and he pays for 100% of their food, clothes, housing, etc, can he use "Child Support" money for that? No, he must still make the monthly "Child Support" payment to the mother in addition to actually supporting the children 100%. Also note that nowhere in the "Child Support" laws is there any consideration of the need for the father to spend money on the children when they are visiting him. Thus the so called "Child Support" laws can and do result in some fathers sending most of the money to the mother, then when the children are with the father, the father isn't able to spend money on them, resulting in the children being deprived financially of things they would have received if "Child Support" didn't exist. How is "Child Support" about support children if fathers must tell their children 'no we can't go to to McDonald's, or the amusement park because DCSE took 65% of his paycheck'. Given "Child Support" money taken from a father can prevent him from spending money on his children, and giving "Child Support" money to a mother does not mean it is spend on his children, "Child Support" can and often does impede support of children rather than help it. If you haven't caught on yet, the only thing about supporting children is the title of the laws and the enforcement agencies. Certainly nobody can claim "Child Support" is about supporting your children if you don't have children. Yet even knowing a man was not the father does not stop DCSE from ordering a man to make welfare payments to the mother and using the above coercive tactics. Take a look at this case where DCSE admitted the man was not the father but still asked the court to put him in jail for not making "Child Support" payments to the mother of somebody else's kids. Since "Child Support" is in no way legally tied to supporting children why do we have it? First off its a bribe to get mothers to file for sole custody rather than sharing children with the father. If the mother choses to share, the attorney's will not be able to make $200/hour for paper-pushing in a custody battle. Many mothers are willing to share custody until they find out not sharing could get them a decade or more of tax free money from the father. Second the States make money off of child support too. 1 Bryce Christensen, "The Strange Politics of Child Support," Society, Vol. 39, No. 1 (Nov.–Dec. 2001), p. 65. This "snare" can easily amount to a prison sentence without trial. 2 The Myth of Deadbeat Dads Stephen Baskerville, PhD, Liberty, June 2002. 3 Technical Analysis Paper No. 42, U.S. Department of Health and Human Services, Office of Income Security Policy, Authors: Meyer and Garansky.